In previous articles we informed you about the different types of oidium. Now it's mildew's turn! However, we will not elaborate on the difference between false and true mildew. This has already been dealt with in a previous article. To read this article you can either search the member section on the website or look through the previous newsletters you received from us. 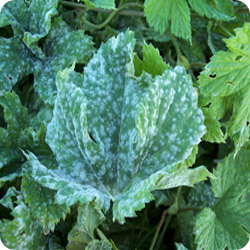 Mildew is the term used for two fungi that cause this disease in hop plants, Pseudoperonospora humuli and Pseudoperonospora cannabina. Because the former is a major problem on hop plants, plenty of information is available on it; though there is hardly any literature on its development in hop in particular. In any case, these mildews are so similar that knowing their symptoms and behavior in hops, we can get a good picture of the effects in hop. As the disease spreads, the leaves curl up, necrotize and end up falling off. The parts of the mycelium containing the spores of this fungus emerge through the stomata of the plant. In good light it can readily be identified as a gray to purple felt on the back of the leaves. As a result, this fungus occurs certain times of the year and in areas with prolonged rainfall. The spores are also scattered on the wind. Spores form by night and day, but are released during daytime. Optimal temperatures for infection are normally between 61°F and 72°F (16-22°C). Once the plant has been infected, development of the fungus is favored by alternating day-time and night- time temperatures. The optimum daytime and night- time temperatures for development of the fungus are 77°F and 59oF (25 and 15°C) respectively. Unlike Oidia, mildew-type fungi are affected more by copper-based preparations than sulphur-based ones. Because it spreads to the internal layers of the plant, you should try to control it using fungicides with a systemic effect, such as monopotassium phosphite.